Neck Pain can really cause a lot of misery in your life, especially if gets worse after sleeping. 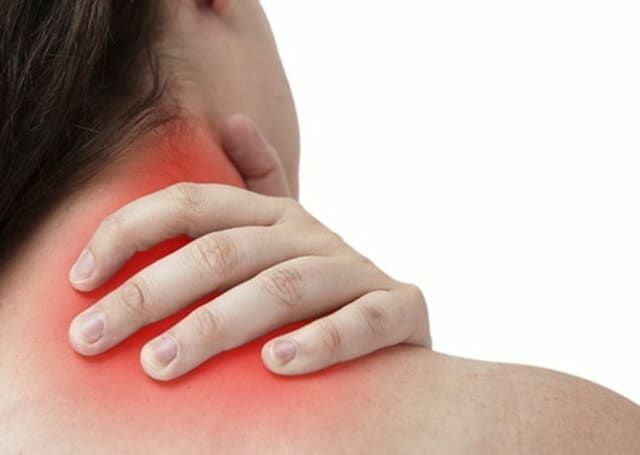 Whether this is caused by osteoporosis, neck injuries like whiplash, damage to the vertebrae, manual labour or simply unhealthy posture while using the computer or watching the TV, for many people it is at its worst first thing when they wake up. If this is the case for you, then you may need to look into getting a good cervical collar that you can sleep in. 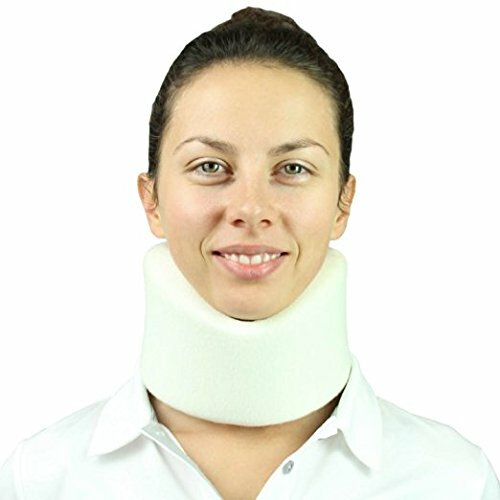 If you are recovering from neck surgery, healing after a bad neck strain, or simply wake up with your neck feeling stiff and sore no matter what pillow you use or how you try to sleep, then hopefully one of our cervical collars you can sleep in will make a huge improvement to not only your rest but also you neck health in general. No one should have to go to bed every night dreading the pain they’ll feel when they wake up the next day, so here at Apex Health and Care, we’ve got all the bets neck supports for sleeping together in one convenient place for you so you don’t have to search through multiple sites and departments to try to find what you are looking for. 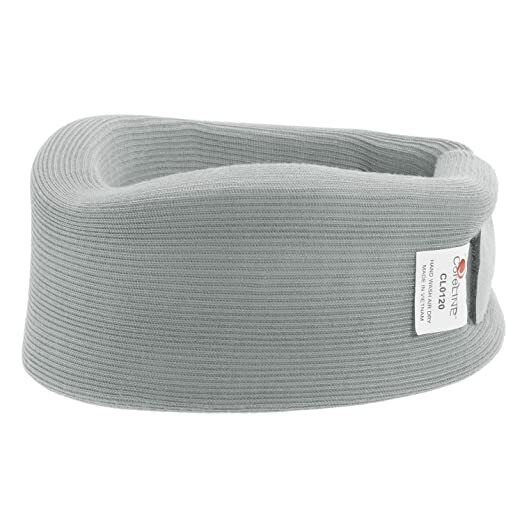 Get a good brace and keep your neck stable and protected while you sleep. Soft Cervical Collar – These work in a similar fashion to rigid cervical collars in that they support the neck and the jaw and the back of the head to take pressure off the spine and allow the neck muscles to relax and repair themselves. They also limit the spine and neck from making any movements that would cause further injury or damage. Most of these collars are fine for sleeping in, but you will find some that have been especially designed with sweet dreams in mind. These can be useful for post operation recovery and mild to moderate neck injuries, as well as just sore, stiff or swollen necks from bad lifestyles. Travel Pillow – On the other end of the spectrum, we have the these. They are not medically designed, rather just consumer products to help you get a bit of shut eye and help protect you from that horrible feeling when you wake up from a long car ride with a stiff, sore neck and a headache. As you can imagine, these might not be the best things for any serious neck conditions, such as surgery or serious accidents, but if you just want to have a good nights sleep or catch some Zs while on the plane, train or bus, these will be just what you want. Have sweet dreams once again with this great soft collar that you can sleep soundly in. 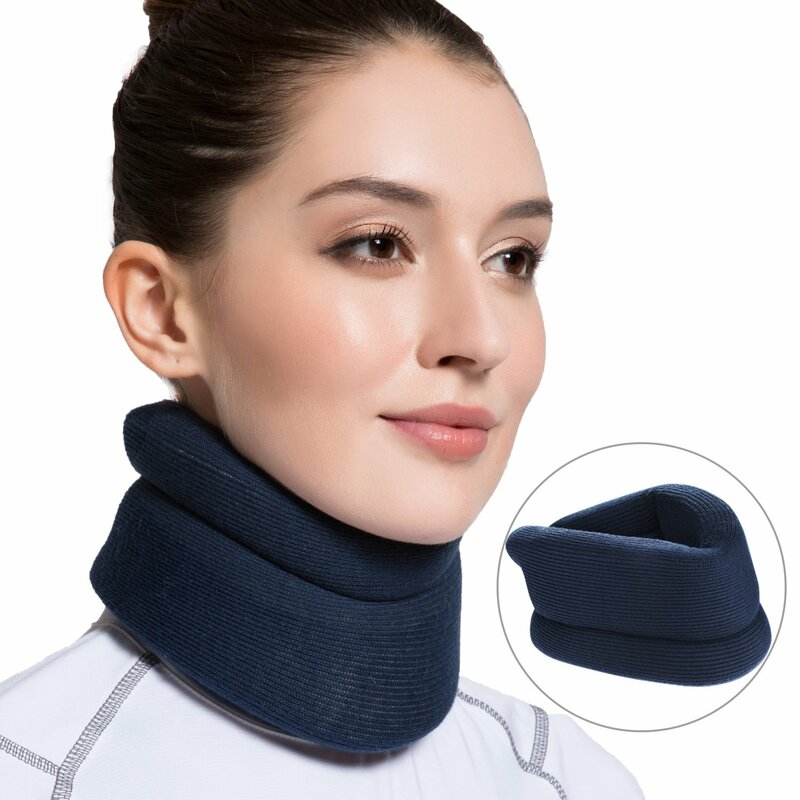 This cervical collar supports the jaw and neck relieve pain by taking the pressure off the spine and neck, and this can easily be worn either throughout the day or in bed, and it will work to realign the vertebrae as it does. It may also relieve headaches caused by cervical strains and sprains. It has an ergonomic V shaped chin contour for extra comfort and support, and it has velcro straps to help you adjust for the correct level of tightness and compression. Not only does it hold your neck warm and safe while you sleep, but because it is made of lightweight breathable fabrics, your neck will stay cool while you wear it, and you won’t wake up with a damp neck covered in sweat and grime. IT is also latex free, so you won’t have to worry about allergies and skin irritations. 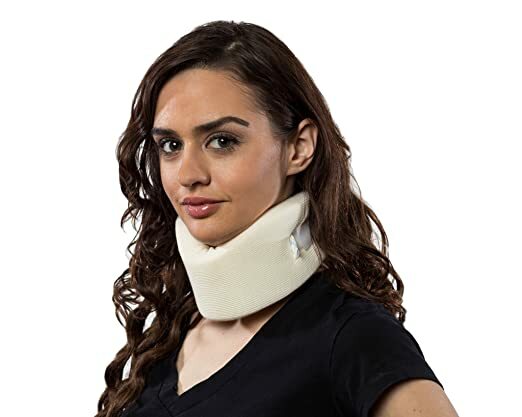 This collar has been specially designed to be worn during sleeping hours, and it ill hold your neck in the proper place for it to heal as well as limiting and movements that can damage your neck or risk worsening any existing injuries that you may have. Whether you are nursing a neck injury, or simply wake up with a sore and stiff neck often because you play too many video games or sit hunched over your tablet watching YouTube or Netflix for many hours, this will help you get a good nights sleep and also wake up feeling fresh and fine without those lingering next pains. Now this really is a unique and innovative product! 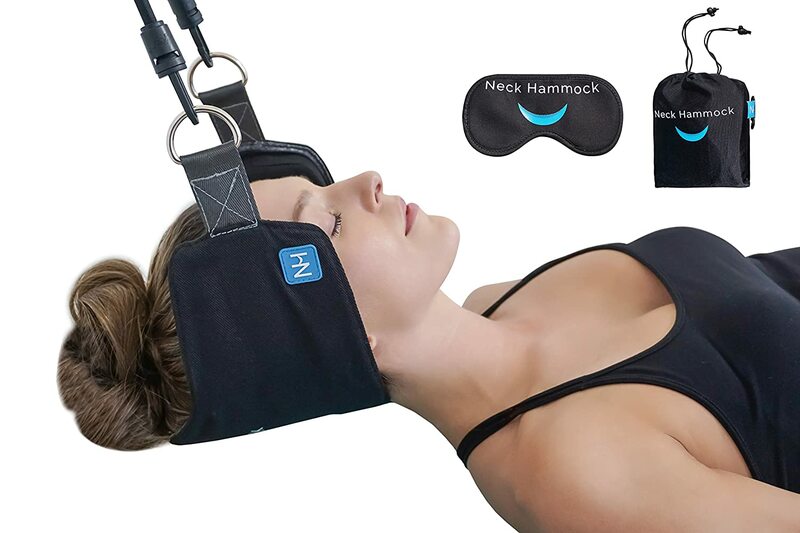 For both relief from common neck pain and help in sleeping, this special hammock of neck brings the cervical traction to your home in a great little portable package that is very easy to use and can attach to any door, and even in just 10 minutes, you’ll start to feel that neck pain sliding away. It works by applying smooth and gentle pressure and constant support to your neck to bring relief and relaxation to tired and sore neck muscles as well as shoulders and back. This comes from the cervical traction that increases blood flow to the effected areas. This also comes with a wonderful eye mask to help you really relax and wish the world away while you use it. 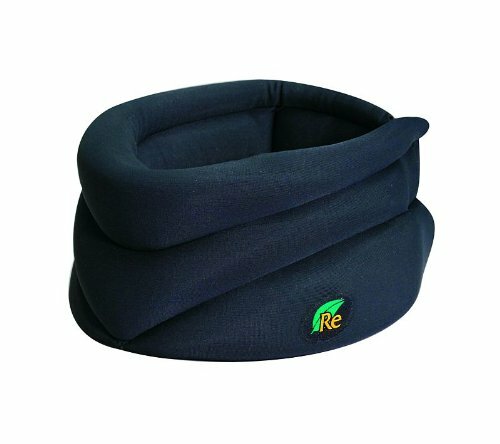 While many travel pillows are cheap and ineffective, this one has been specially orthopedically and ergonomically designed to give you brilliant neck support from its internal plastic frame which is hidden within the soft fleece lining. 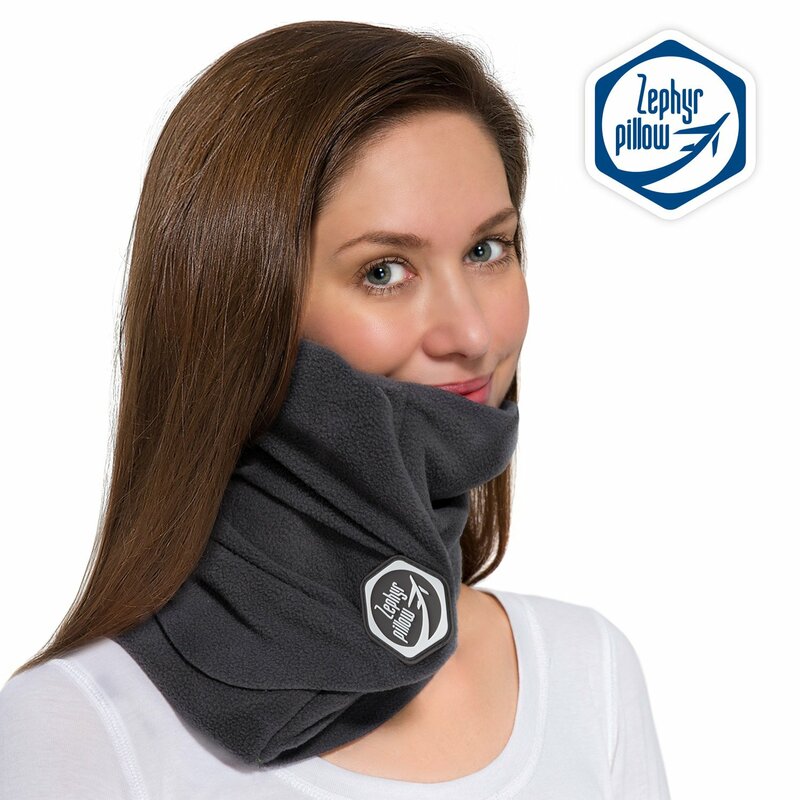 It can help prevent long-haul flight neck pain and soreness by giving the neck firm and comfortable protection and support from all sides, but this is especially designed for side sleepers. We really like that the fleece cover of this pillow is 100% machine washable, simply take out the plastic frame and pop the fleece in the washing machine. It also comes with a hand travel bag and an eye mask as a free accessories, which are both very handy. Just make sure that you don’t leave it on the plane when your flight lands! Made of a made of medium density mixed sponge and a bi-layer stack of high elastic EVA foam, this collar tops of the chars in terms of both its comfort and resilience. The brace supports the jaw and neck, holding the neck in the correct posture while it is also stabilizing the vertebrae and helping to relieve the pain caused by pressure in the spine. The non-rigid collar may help with headaches caused by cervical strains and sprains. Whether you’ve had a bad bash on the football field or you’re coming off a mild surgery, this will help in your rehabilitation provided that you rest up and take care of yourself. You can also wear it while you sleep, and it is small and compact enough to take with you wherever you go. What really makes this one stand out is its unique and innovative design. It has a V shaped contour under the jaw for added comfort as well as a the curve rise at the back to ensure stronger and more stable support for the neck than most other styles of collar. Velcro straps can also be used to adjust the level of compression. This also absorbs sweat quickly, and it is fully latex free, so great for those with allergies. Finally, this is really easy to put on and will fit most necks, so it is a ‘one size fits most’ product. Help get your neck back into shape and kiss neck pain goodbye with this amazing soft cervical support. This brace keeps you safe and supported by restricting your head movement head movement which can speed up the recovery time for accidents like a herniated disc, spondylosis, neck sprain and other medical conditions that affect the vertebrae. It also limits your cervical motion, so it will stop you from moving your neck in an unsafe way and remind you not to make sudden or jerky movements. Therefore, you won’t be in a position to re injure yourself. This feels very comfortable on your skin, and its Velcro straps will let you tighten or loosen it in order to get the desired level of compression. You can also wear this while you sleep. Whether its for whiplash, neck train or just too much time texting, this collar will have you right as rain in no time. This is an innovative neck rest that is designed to give your neck comfort and support wherever you need it, be that at work, while you sleep, on the plane or anywhere else. A multi purpose collar with an adjustable contour fit to make you feel like your neck is being hugged by angels. It is lightweight, easy to carry, and you can always slip it in your bag and take it with you on a flight or long bus and train journeys. If you are looking for superior pain relief and injury support for you neck, than look no further! 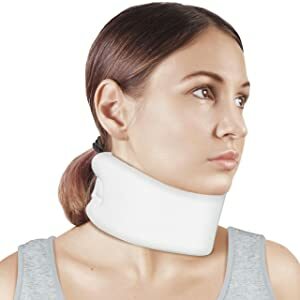 Cervical support collar holds the head under the jaw to relieve weight and pressure in the spine, all the while limiting any dangerous neck movements. This can be worn throughout the day to help with stabilizing vertebrae, and it will even be nice and comfortable while you sleep. 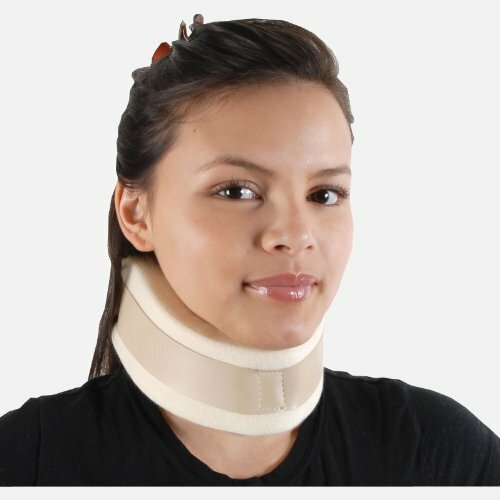 This non-rigid brace may also relieve headaches caused by cervical strains and sprains. It may also be good for recovery after mild surgery. 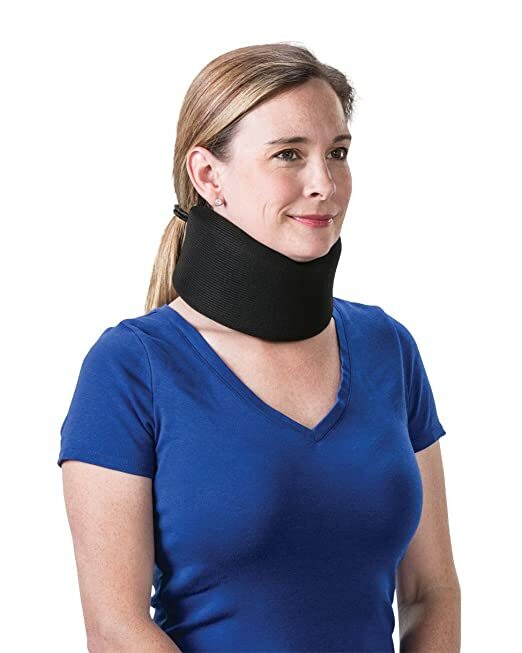 This can accommodates neck circumferences ranging from 15”-20.5”, while will be fine for most people, and you simply wrap it around your neck and fasten the velcro once it feels good. You can also easily adjust this if it is too tight or loose. It has plush foam padding to give you a warm and comfortable fit, and it is made of breathable knitted material to keep your neck cool and smooth. This is also latex free, and comes in black or white, in case you have strong preference for either color. Don’t let neck pain hold you back from getting a good nights sleep. 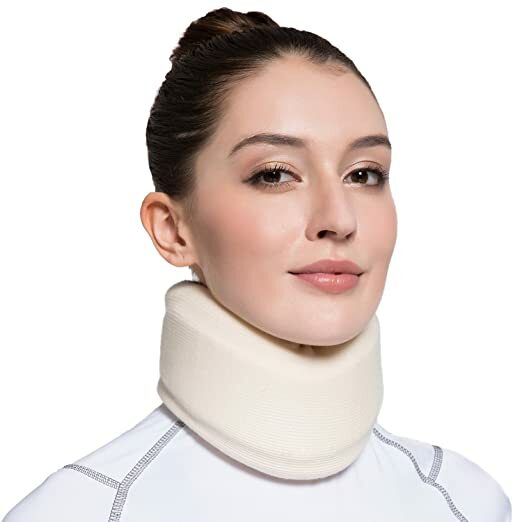 Optimal neck support will help you heal without completely restricting your range of motion, however the collar will serve as a reminder to you if you move your neck or head in a way that will be unhealthy. The cushioned but firm foam offers both protection and support as well as comfort, the ideal for a swift recovery. Best of all, the foam core is lined with a very a soft cotton blend, so you won’t have to worry about itchy or irritated skin. Also, as cotton is breathable, this will help your neck stay cool. You can also hand wash this with soap and cold water, so even if it does get a bit grimy and stinky, you can get the dirt and smells out easily. If you do, make sure you hang it to dry as your dyer might destroy this. This comes in small, medium and large for neck circumference of 14″ – 25″, so even if you have a very big or small neck, one of these should be an ideal fit for you. Catch some Zs easily and safely despite your neck injury with this wonderful sleeping brace. The Hely & Weber Cervical Collar 619 has been expertly designed and manufactured to provide ergonomic support of the highest standard to your stiff neck. With a medium/ firm density urethane core that easily fits around your neck, this will always give everyone a comfortable fit and its vinyl strap brings additional support and durability against from daily wear and tear. The core has a special stockinette covering which helps your skin by first feeling soft and removing and cause of irritation while also letting it breath. We really like that is available in either 2″, 3″, or a 4″ height, as so many neck collars are simply ‘one size fits all’ but there is definitively not one size of neck in the world. e. The Hely Weber Collar may help with any number of cervical injuries, including strains, whiplash, text neck, neck pain, inflammation and more. This made in america collar has a a filling of low density foam covered with a 100% cotton stockinette, to give you both the very best in terms of comfort and support while you snooze. It also has a contoured design and hook and loop closure to make it easy to adjust and get the perfect fit. While wearing it, the head is held in a neutral position while the jaw is supported, which helps with pain relief and healing by taking pressure off the neck and serves as a gentle reminder to make sure that your head doesn’t make and dangerous movements that might reopen a wound or cause more damage to a strain or whiplash. The collar will fit most adult necks up to 24” (61cm), and it comes in 4 sizes from 2 inches to 3 inches high. We really like this one as it is hand washable, so in the event that you have to wear it alot, you can easily wash off all that grime. For those who still wake up with sore necks everyday, it might be worth looking it not changing your pillow and looking at the way you sleep. A good feathered pillow or memory foam pillow will wrap around the shape of your neck and help you sleep in a way that your neck is not bent or twisted, which is often the cause of neck pain first thing in the morning. also, sleeping on your side or your back is the best for your neck, as sleeping on your front can cause it to bend in an unnatural way and leave your neck sore and cold when you wake up. 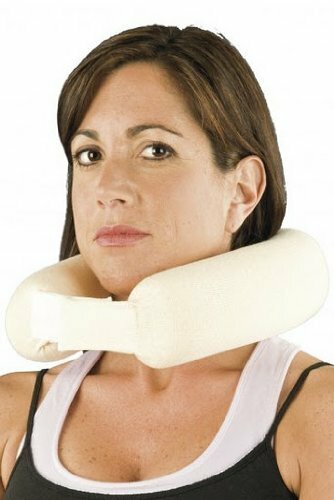 If you wake up with a sore neck but can’t work out why, it might be time to think about getting a proper neck pillow or support pillow. These can really help you get a good nights sleep and say goodbye to that frustrating sore and stiff neck that greets you in the morning. We are not in a position to give you professional advice here, and especially if you have just had surgery, a neck accident or have some kind of vertebrae damage, your doctor, surgeon or physiotherapist is the one who should be advising you. However, if you feel that you simply have a stiff neck in the morning, perhaps from watching Netflix over your laptop for too long or maybe because you simply slept in an awkward position, those stiff and cold muscles and tissues in your neck might simply need some good old fashioned stretches and exercise in order to loosen them up and banish you pain. These should be safe for anyone who does not have any neck injuries or chornic neck problems, but feel free to ask your doctor if you are not sure. It should only take you 10 minutes to get through these, and you can easily make them part of your morning routine. Exercise 1: While standing, look straight ahead and drop you head to one side Hold for 10 seconds, then swap sides and do it again. Do this a few times for each side. If you feel the stretch isn’t going far enough, you can try dropping the opposite shoulder. Make sure that you do this gently and slowly, and DO NOT make any jerks or sudden movements. Exercise 2: Standing again, Keep your shoulders back and straight while you slowly bring your chin down to your chest. Hold this for about ten seconds, and then look up to the ceiling as far as you can go and hold that for a similar amount of time. Repeat twice more. Exercise 3: Next, standing straight again,simply look over to your right shoulder as far as you can, not straining or jerking, and hold for a few seconds, then look over to your left and do the same. Repeat this a few times. If you notice that there is a pulling, pinching or tight sensation on one side more that the other, that shows you that you’ve found the knot responsible for your pain and stiffness. Exercise 4: Lie on your back and look straight up at the ceiling. Put your tongue on the roof of your mouth (we know this sounds silly – trust us) and then press your chin to your chest for about 10 seconds. After that, lift your head and neck up, imagining that there is a bend in the base of your skull, and hold this for about 10 counts as well. Hold this for 10 and relax. Try to do this over and over but slowly for around two minutes. This lengthens the muscles in the back of the neck. Exercise 5: Once again, while standing straight up and with your shoulders relaxed and back, try to slowly push your head out forward (like a chicken) and hold that for 10 counts, then bring your head all the way back and hold again. Repeat another 5 times and, and then your little neck stretching session will be over.